We were at the visitor center at Lassen National Park poring over the map. For a nature lover there are many interesting things to do here. 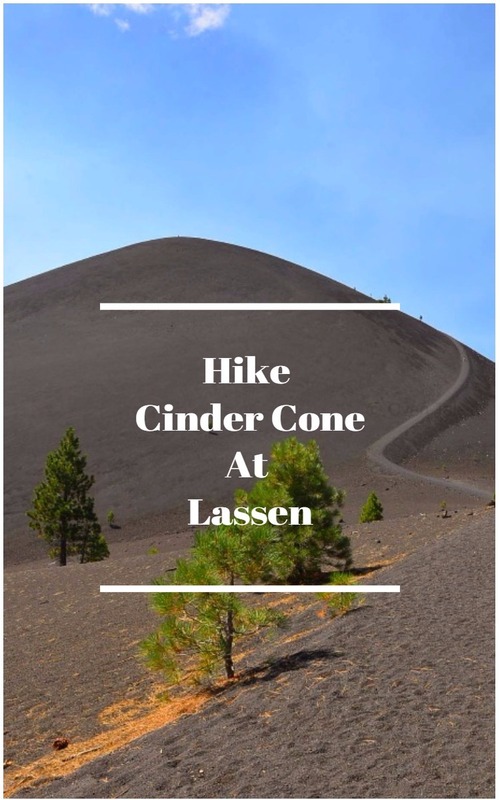 I knew what I must to do the minute i saw the picture of the Cinder Cone Trail. 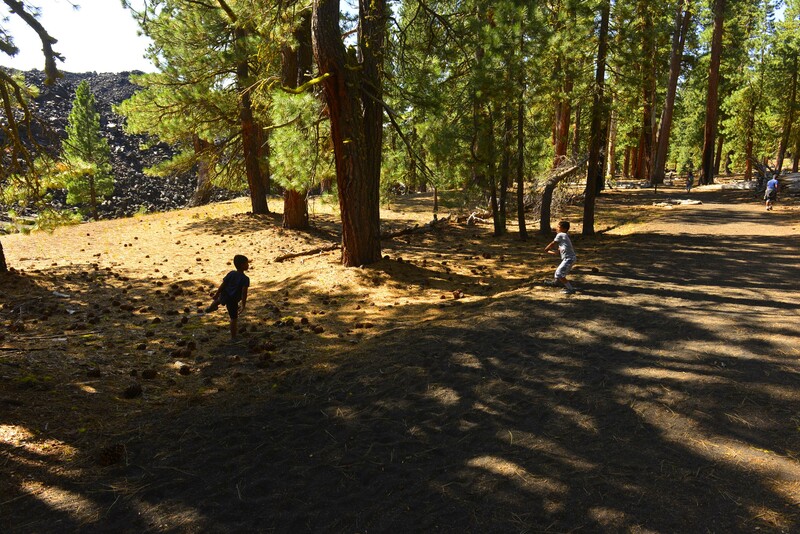 Lassen has no dearth of volcanic domes – around 30 in all. 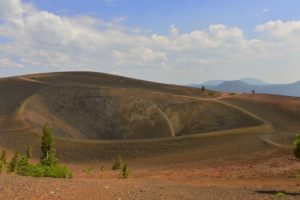 May be I am hopelessly lost when it comes to certain things – but look at Cinder cone – doesn’t it look special ?? 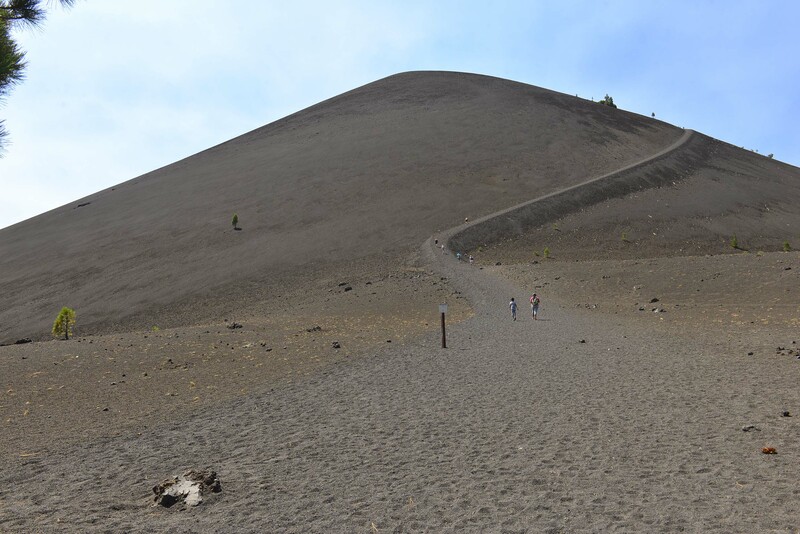 This is a 700 ft high Volcanic cone , which has been dormant for over a century (at least). It is hard to resist an opportunity to check out the place from where earth’s fury has been unleashed over and over !! The entrance to this trail is at the Butte lake parking area, at the North east corner of the park. If you plan to drive up , do keep in mind that from Highway 44 the road to Butte Lake is unpaved. Though our ride was uneventful, in retrospect a spare tire is a good thing to have! 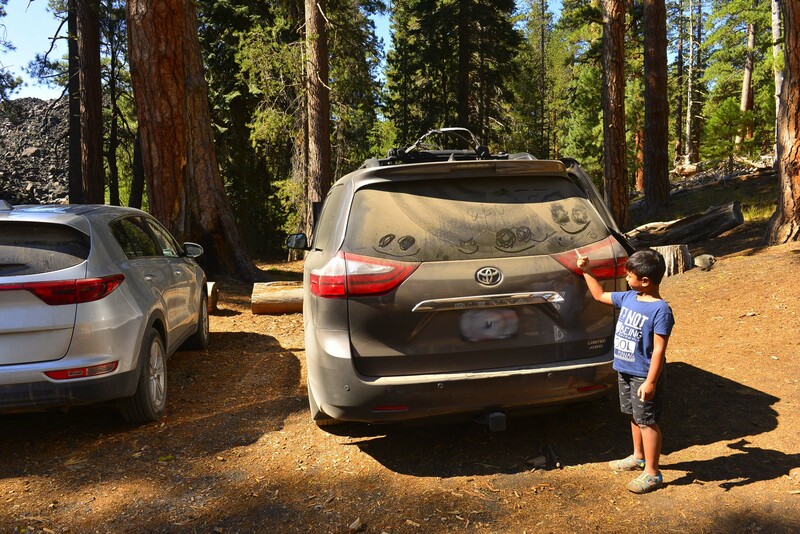 This is a beautiful place to camp – the weather was pleasant at the peak of summer, the lake cool and clear , the mountain air invigorating, and scenery unmatched. I wasn’t kidding when I said the road was unpaved. As you survey the area, the trek doesn’t seem hard. To be fair it is a an easy trek, that is until you reach the base of the volcano. 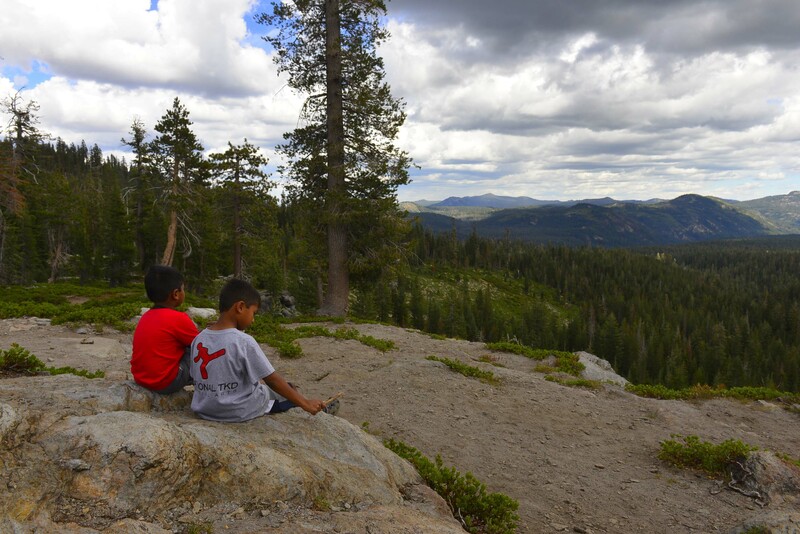 The trail to the base follows the Nobles Emigrant Trail – which was used until the railroads became more popular. 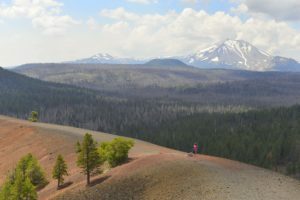 It is a pleasant stroll through the the Jeffery pine forest , with great views of the fantastic lava beds. There is no trail through the lava beds. The lava rocks vary in size, from few centimeters to up to 100 ft and are not stacked tightly, offering convenient hiding place and burrowing grounds for the fauna. Not hard to imagine horse carriages passing through here . Once you arrive at the base of the volcano, be sure to take a break and enjoy the scenery. From here it is easy to see the thick waves of lava flow. If you are here before mid day the climb up is partly in the shadows, on the other had in the evening the sun may not be your ally but the views will be spectacular. A word of caution though, it you are planning to catch the sunset at the top do pack a flash light along . The climb up the volcano is hard. The trail here is quite steep. The sides of the volcano as well as the trail is covered with black cinders. These small rocks give way under your feet making the progress difficult. As if that isn’t enough rock and sand get in through the shoes, making it even more unpleasant. Slow and steady wins the race here, except there is no race :-). Half way up the mountain Lassen peak becomes visible, as if to remind you to take a break and catch your breath. Did I make it sound too tough? Well don’t be discouraged ! To be frank there were many septuagenarians who smiled at us kindly as we struggled to climb up. DH was greeted by an 80 year old lady as he was helping our 6 year old up the way. 6 to 80 is a good age range, don’t you think ? So yes you can do it ! Once you reach the top, the view makes it all worth the trouble. There is evidence of nature’s power of destruction all around, mixed with beauty and the resilience of life! Here you take comfort in the fact that all these volcanoes are extinct(?) . But if you have information other wise, please don’t educate me – at least not until I have been there once more. 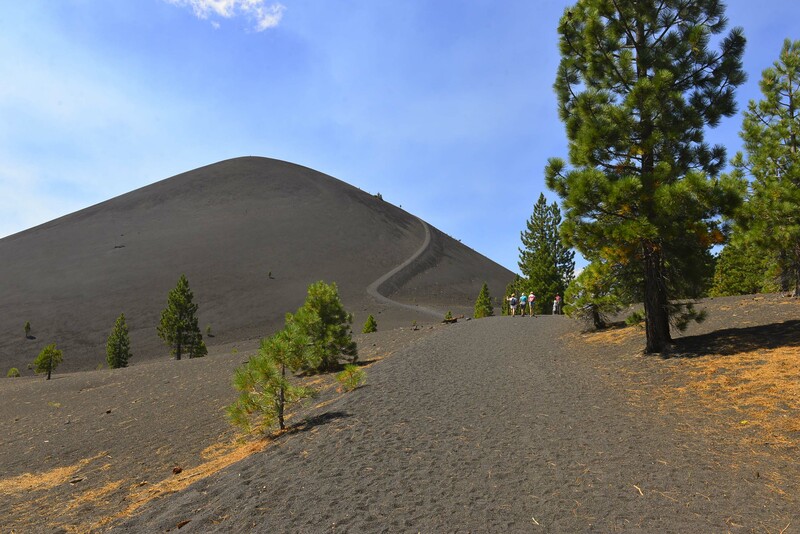 At the top of the volcano the trail goes around the outer rim as well as the inner rim. 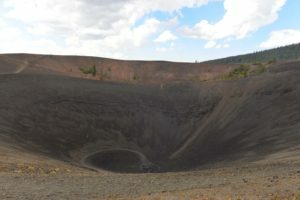 The trail to the bottom of the crater goes down from the inner rim. 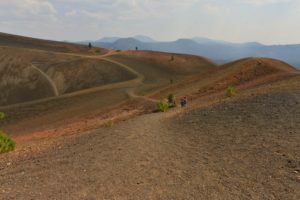 The path along the rims are not hard to navigate at all, but the trail down to the crater is made up of volcanic rocks bent to hampering your progress. Now that you have conquered the beast why get scared by a pet bunny !! The way back down is much much easier — you could even run down in a few minutes. Notice how we do not have any pictures of us climbing up. Between the kids , the rocks and the the tough climb , lets just say we had more pressing matters at hand ;-). 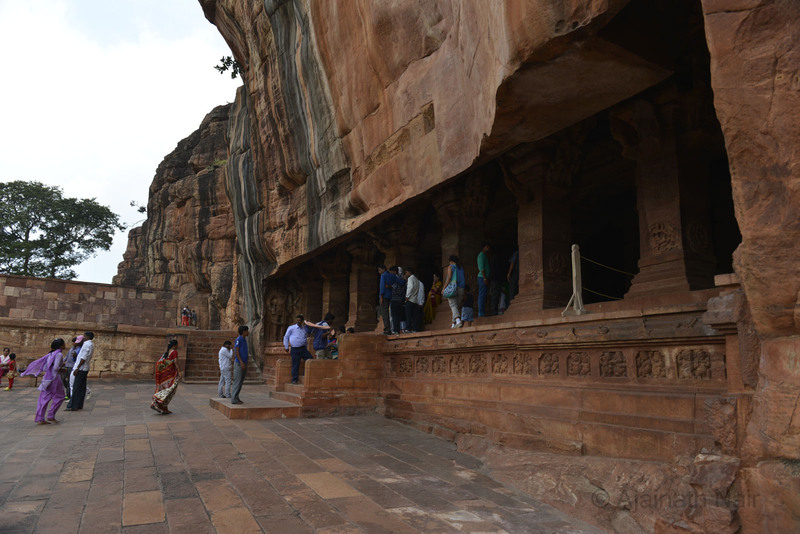 The Challenge – This is a challenging trek. Even the ones in their peak of health find the trek up to be tough , but it is not dangerous. Pickup a leaflet at the trail head of from the visitor center. It is a good way understand the geological features along the trail. Hiking boots – your best buddy on the way up. Hiking sticks – the second best. Most of all – Take your time and enjoy the scenery. Remember it is not a race !! !